Go on a winter adventure with your little ones this month by checking out these holiday happenings. From seasonal light displays and Santa sightings to parades and “real” snow, this guide is your roadmap on how to experience the most magical and wonderful time of year with your family. Enjoy the annual celebration of twinkling lights, festive decorations, visits from Santa and Mrs. Claus, the Parade of Trees, the life-size Christmas Cottages, Slidell’s Nativity, and Christmas songs. Bring along the entire family to see the classic holiday film, The Polar Express, at 3 p.m. Before the showing, you and your kiddos can sip on complimentary hot chocolate. Noel Acadien au Village features half-a-million lights, including the fully lit Chapel. There will also be live entertainment, carnival rides, local cuisine, photos with Santa, and holiday shopping. Enjoy the sounds of the season in Let it Snow. Features a wide variety of holiday classics from Frank Sinatra, Chuck Berry, and Brenda Lee, and includes a stunning finale by Trans Siberian Orchestra. Hike a mile with your kiddos while checking out over 50 illuminated sculptures of animals and holiday displays. This year, the Zoo is partnering with the Greater Baton Rouge Food Bank. Every guest who presents a non-perishable food item will receive a discount from the admission price. This spectacular holiday lights festival is fun for all ages and has become a holiday tradition for families. See the light displays and the dozens of Christmas trees, and ride the two-mile train ride through glittering light exhibits. See the incredible light show on Baton Rouge General’s campus at the corner of Bluebonnet Boulevard and Picardy Avenue. Until January 1, the lawn in front of the hospital will be transformed into a twinkling, singing and musically synchronized lights display. Experience the Louisiana Holiday Trail of Lights, while checking out all of the wonderful holiday events along the way. Festivities generally run through the New Year. Some of the popular and recurring events include shopping/dining/entertainment at the Louisiana Boardwalk Outlets in Shreveport-Bossier, Fasching Festival in Minden, shopping and dining in Antique Alley in Monroe-West Monroe, Festival of Lights in Natchitoches, and the Christmas parades in Alexandria/Pineville. Experience two miles of custom magic as the Lamar Dixon Expo Center hosts this award-winning light and music extravaganza. See custom-made displays dance to the music played over the radio in your car in perfect synchronization. Also, your kiddos will get a kick out of seeing Santa and his friends at the Beach Party. Trumpeter, bandleader and producer George Bell has brought together an all-star line-up of musicians for these special holiday performances. Pick up a few gifts for your loved ones still on your shopping list at the Baton Rouge Arts Market. This open-air market is held in conjunction with the weekly Red Stick Farmers Market. Starts and ends at Broadmoor High School at 2 p.m. Spectators are asked to bring a non-perishable food item to be donated to a food pantry. Includes family activities, food, and shopping for the entire family to enjoy. The parade begins at Joor Road and goes from Hooper to Lovett at 10 a.m. Annual parade with a festival after the parade until noon. Show off your creative side by creating your very own ornament with your little ones in this hands-on workshop. Performance by students from Runnels School at 2:30 p.m. Check out the poinsettia display and sale at the Botanic Gardens from 8 a.m.-noon. The Botanic Gardens is one of the nationwide trial locations for new and classic poinsettia varieties. From 10 a.m.-1 p.m., kiddos and their loved ones can enjoy a jazz brunch, Mr. Bingle, a holiday-themed photo booth, interactive caroling with Louisiana History Alive characters, holiday crafts, cookie decoration, and games. Cost is $25 for non-members. 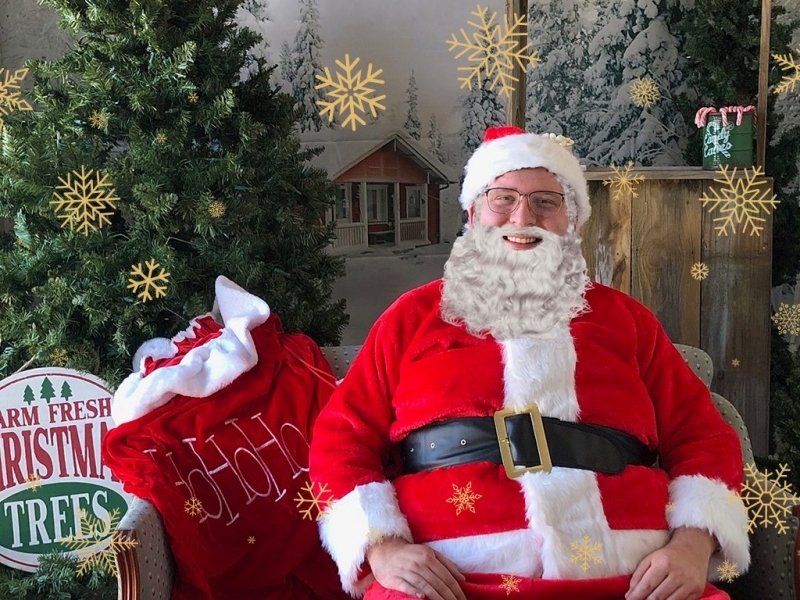 Photos with Santa from 11 a.m.-4 p.m. Hosted by Councilwoman Chauna Banks, Metro Council District 2, and the Jewel J. Newman Community Center. Run with green and red powder at 10 a.m. Dress in Christmas-themed attire for the chance to win a prize. Includes food, live music and vendors. Registration runs $25-40. There will be 40 vendors in attendance from 10 a.m.-5 p.m. This event is sponsored by Sixela Kouture in Partnership with Young and Tailored. Free admission. Enjoy live music, food, vendors, and get a chance to meet Santa from 10 a.m.-5 p.m. Sponsored by 100.7 and Tour Ascension. Tickets are $15. A timeless, charming Christmas story that illustrates the love and generosity of the holiday season. Tickets are $19. See the holiday favorite come to life with dancers from Houston Ballet II. Parade starts and ends at Walker High School at 2 p.m., followed by Santa in Sidney Hutchinson Park at 5:30 p.m.
Ring in the holiday season with a 19th century Louisiana celebration, including demonstrating artisans, open-hearth cooking, storytellers, and costumed re-enactors. On the steps from 3:30-5 p.m. Enjoy eating latkes, visiting kids’ booths, watching a Gelt drop, and a Menorah lighting! Hosted by Chabad of Baton Rouge. Performance at 3 p.m. Christmas and seasonal songs performed by the Baton Rouge Concert Band. Free. Let your little ones bring along their holiday wish lists for this special opportunity to see Santa before he makes his great journey around the world in one night. Family art workshop, choirs, elf scavenger hunt, Papa Noel, gingerbread and hot cider from 2-5 p.m. Free. Indulge in the rich sounds of the season, including “Let it Snow” and “Sleigh Ride.” This concert celebrates the many holiday traditions of our community. Get ready for the holidays by shopping the Market for your holiday gift and decoration ideas at 11 a.m.
Over 20 vendors with all handmade art items, local musicians, and local food. Includes various foods until 5 p.m., Father Jason’s Christmas village, arts and crafts, Santa, hayrides and train rides, a classic car and truck show with a light parade at 5:30 p.m. The Kansas City Southern’s Holiday Express will roll into town this month, bringing Santa Claus and his elves to spread some Christmas cheer. Guests can visit with Santa and walk through three cars filled with holiday displays. Meet and Greet with Santa and Mrs. Claus, storytime, songs, crafts, letters to Santa, a real reindeer, cookie decorating, and photo props from 6-7:30 p.m. Tickets are $35. Parade will end at Springfield Fire Department for snacks, and to see Santa Claus. Includes entertainment, Santa, cookies, hot chocolate, and a free gift to children from infants to fifth grade. Start Christmas in style as Santa and his merry helpers take you on an unforgettable nostalgic journey, featuring glittering costumes, a dazzling cast, and the highest kicking chorus girls on this side of the North Pole. Interactive story cabins, live animals, a Bayou Express Train with a Christmas light extravaganza, Santa, hot cocoa, and pastries. Free, but must request a ticket. Christmas story reading, cookies, hot chocolate, and gingerbread house making. Children are encouraged to wear their PJs and can plan to meet Santa Claus. Event by Baton Rouge Parents Magazine. Tickets are $10 for adults and $25 for children with Santa photos running $10-18. Tickets must be pre-purchased. Preview the downtown lights, enjoy a glass of champagne at each stop, listen to holiday carolers on the trolley, and learn more about what’s planned for New Year’s Eve. There will be prizes and surprises at each stop. Dance the night away to the sounds of Phat Hat while enjoying food and merriment in support of The Hospice of Baton Rouge. Enjoy brass renditions of holiday favorites during these two wonderful performances. Capture the magic and joy of the Christmas season with this holiday favorite as the ghosts of Christmas Past, Present, and Future lead miserly Ebenezer Scrooge on a powerful journey of transformation and redemption. When a mysterious group of Kings arrives on the doorstep of a poor mother and her son, the mother is faced with a life-changing decision. Opéra Louisiane brings together a community of voices for these exceptional performances. In the spirit of Amahl’s gift, all who are able are encouraged to bring an unwrapped toy or gift to the performance for a child in need. Black Nativity is a soul-stirring rendition of the Christmas Story that fills the theatre with thrilling voices, exciting dance and glorious gospel music in these incredible performances. See the lighting of the Christmas tree, peep into the holiday homes, ride the Polar Express train, and enjoy live music and food throughout the weekend. The village comes alive with synchronized Christmas light displays, Christmas performances and music, special entertainment for children, a visit from Santa, tours of decorated historical homes, arts and crafts booths, and gourmet food trucks. Buddy, a young orphan, crawls into Santa’s bag of gifts and is transported to the North Pole. The would-be elf is raised, unaware that he is actually a human, until his enormous size and poor toy-making abilities cause him to face the truth. Celebrate the holiday season with music, food, bonfires, fireworks, and a visit from Santa. There will also be three Christmas Marketplace Days on December 4, 16, and 18, and a Christmas Eve buffet on Christmas Eve. The plantation comes to life during the holidays, as it shows off its seasonal decorations. Costumed guides accompany you and your family on a trip into the past through the candlelit Oakley House. Take a taste of what’s cooking in the kitchen, or just enjoy the yearly Christmas dance while listening to live period music. The event will feature more than 100 artists and craftsmen. This year’s festival theme, “Christmas Past Classics,” will give nod to classic holiday films, including The Grinch, The Santa Clause, A Christmas Carol, Elf and Polar Express. The parade will roll at 5:30 p.m. It includes about 80 entries, including marching bands, dance troupes, nonprofit organizations, and local businesses. Presented by Kiwanis Club of Denham Springs, the parade’s theme for the year is “Christmas on the Bayou,” The parade will begin at Healing Place Church on Florida Boulevard. Celebrate the sights and sounds of the season during the annual parade in Zachary. Celebrate Christmas with French Creole traditions. This holiday event includes music, storytelling, carriage rides, folk crafts and special demonstrations. The Fair also features local artisans and craftspeople offering handmade items for sale. The parade features bands, marching groups, and floats at 1 p.m.
Heat up the holidays with Cool Winter Nights and Hot Jazz. The performances will feature Brian Shaw, Willis Delony, and Bill Grimes as they perform holiday favorites, including the classic version of the Nutcracker Suite. Visit the Train Station for family-oriented activities at the tree lighting at 7 p.m.
Cangelosi Dance Project presents the Holiday Nutcracker, taking you on a journey with Holiday Spirit and Land of the Sweets. Live Nativity with the theme of Unconditional Love, taking place at 6:30 p.m. and 7 p.m. on Friday and 6 p.m., 6:30 p.m., and 7 p.m. on Saturday. Drive through the grounds of the West Baton Rouge Conference Center to view the spectacular lights, visit the talking reindeer, walk through the holiday decorated rooms, and enjoy carnival rides for the children. Free drive-through live Nativity with Christmas carols on the radio from 6-8 p.m. Gather the entire family to experience the holidays the BREC way as Santa makes his stop at Gus Young Park. Be sure to take a photo with Santa, while enjoying free holiday-themed games and activities. Baton Rouge Ballet Theatre’s holiday classic enters a new realm this year. Bringing together internationally acclaimed guest artists, local children, professional and pre-professional performers, and the Baton Rouge Symphony Orchestra, The Nutcracker: A Tale from the Bayou, is sure to delight audiences with its lavish choreography and costumes and creative new twists. 5K and one-mile family fun/run and dog walk and an ugly sweater contest for participants and their dog at 8:30 a.m. Registration costs $15-35. Sing traditional carols, both religious and secular, with music director, Jude Wilson. Song sheets will be provided. While most of the students of Room One are excited to plan the perfect holiday party, Junie B. Jones has other things in mind. After pulling the name of her enemy, Tattletale May, for her Secret Santa Gift, Junie B. Jones thinks this is the perfect opportunity to give her enemy what she deserves. The River Center will magically transform into a winter wonderland so you and your kiddos can create holiday memories. Enjoy a traditional Cajun Christmas with more than 100 bonfires. The purpose of Christmas Eve bonfires is to show the Cajun Santa Claus–known locally as Papa Noel–where to fly and land as he soars across southern Louisiana. Gather around for a Christmas feast with loved ones at Crowne Plaza Baton Rouge. Singer-songwriters from Louisiana will perform while “home for the holidays.” Celebrate their successes with them, and learn what’s coming up next in their careers.